I had this idea that maybe, rather than a society organized over some ideology, nature designed us to function in societies that are based only on needs. 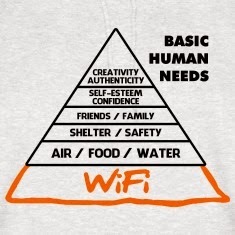 Actual needs, like having a home and something to eat. Apparently, this is a cool shirt print. So, this would explain why all the communities that were ever based on an ideology, always found themselves quickly falling into turmoil, and splitting into conflicting sections. This easily explains the history of religions and philosophies. However, this would also explain why it is that places that would have been expected to be extremely inhospitable, full of conflicting ideologies and strange peoples, all in one place, still exhibit the best of human societies! America! Well, not everywhere in America, but this is definitely evident where the need for "freedom" had been safeguarded. In North America, especially in states like California, we see the most diverse and most advanced, liberal, and fascinating societies in the world! Maybe societies should be planned for basic needs, rather than some higher ideological-political scheme, and then we would all be happier.